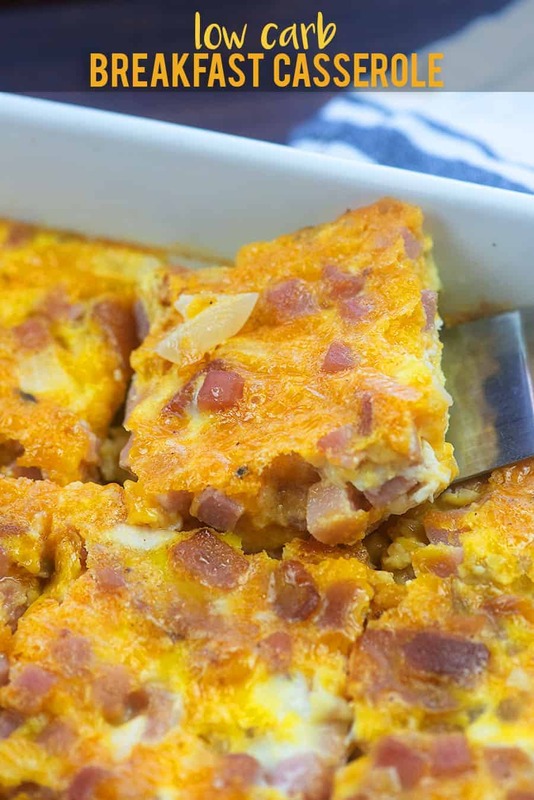 Breakfast casserole with ham makes the perfect hearty low carb breakfast! 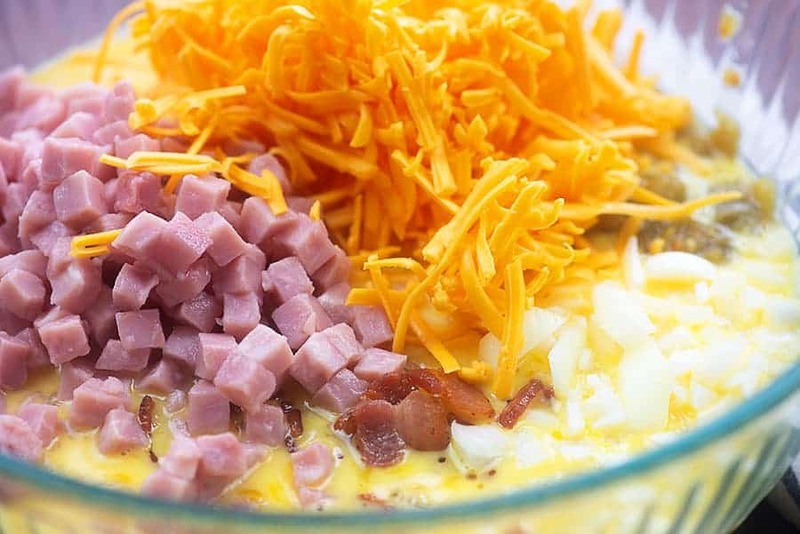 Use leftover ham or start with a package of diced ham and enjoy this easy breakfast casserole! 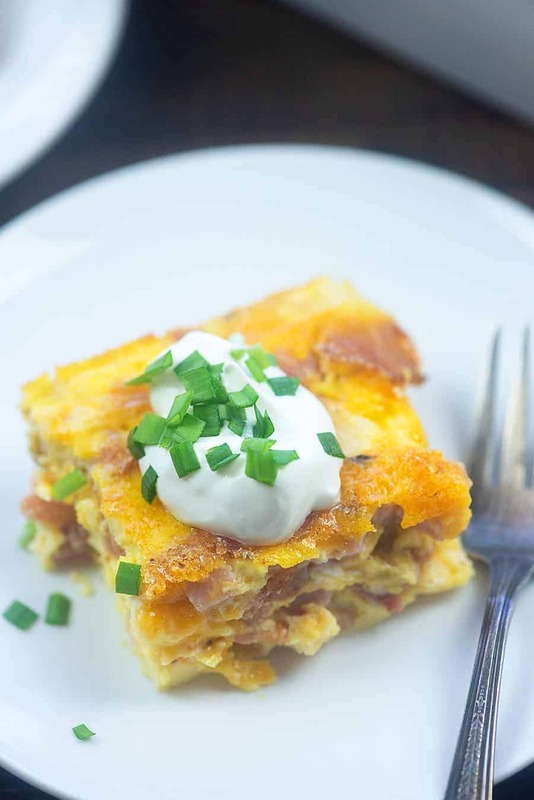 Breakfast casserole is a whole big thing in my house! Probably because my husband is straight up obsessed with breakfast. 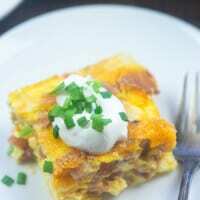 I like a good breakfast casserole because they’re usually easy to whip up and can often be made the night before. He likes breakfast casseroles because they’re usually full of things like ham, sausage, and bacon. The man loves him some pork products. ? 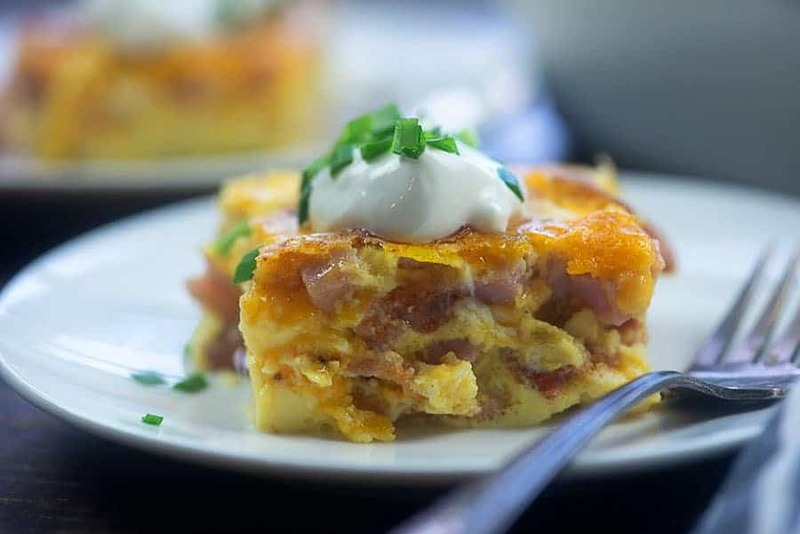 This breakfast casserole with ham is super simple to toss together and tastes amazing. We serve it up on the regular and I bet you will too! First up, we’re going to add a dozen eggs to a large mixing bowl along with some heavy cream or milk, depending on your preferences. I like to add in a couple dashes of hot sauce too. Dump in some diced ham, fried and crumbled bacon, some minced onion, and diced green chiles. You’ll also want a couple handfuls of grated cheddar and a little salt and pepper. Stir everything up to combine and then pour the mixture into a greased 9×13 baking dish. This will bake up in a hot oven in just about 35-40 minutes. The edges should start turning a little brown and the center should be set. We like to serve this with a dollop of sour cream and some chopped green onions. This restaurant style salsa also makes a great topping! 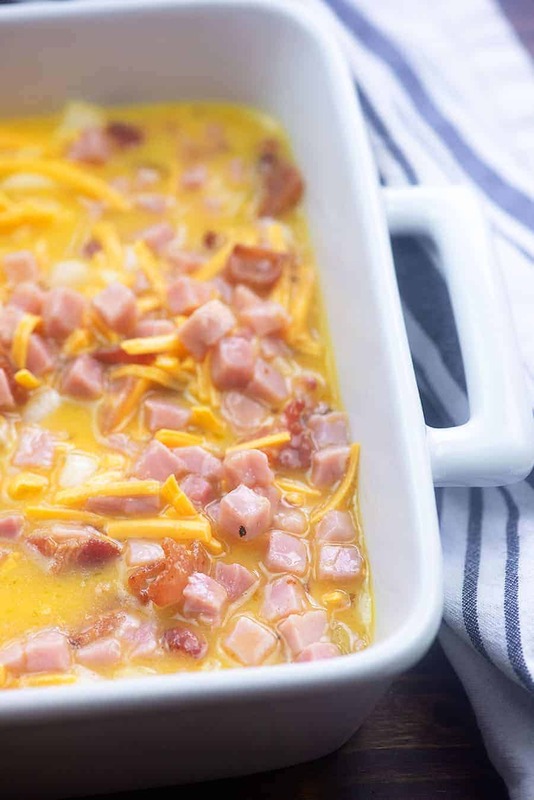 This low carb breakfast casserole is packed with ham, bacon, and cheddar! Pre-heat the oven to 350 degrees. Spray a 9×13 baking dish with non-stick spray. Crack the eggs into a large mixing bowl and add the milk and hot sauce. Whisk together until well combined. Stir in the ham, bacon, cheddar, onion, chiles, salt, and pepper. Stir until well combined. Pour the mixture into the prepared baking dish and bake for 35-40 minutes or until eggs are set and edges are golden brown. Let cool 5 minutes before slicing and serving. Serve with sour cream and green onions, if desired. Use almond milk or heavy cream in place of cow's milk, if desired.